Doug & Elizabeth Simpson from tenderfoottraining.com have decades of experience in dog training and solving canine behavioral problems. Their techniques are based on the mutual trust, love and respect that dogs and owners have for each other. They have been contributing experts on Pets.ca for several years and have graciously agreed to contribute to our blog on a regular basis. This is their FIRST post. Thanks Tenderfoot; you rock!! Went to the dog show last weekend – Denver’s Rocky Mtn. Cluster shows – our own version of Westminster, so we attract many dogs who are top in their breed. I always love to go and just wallow in the incredible assortment of breeds and try to get to know a breed that I normally wouldn’t get a chance to spend much time with. 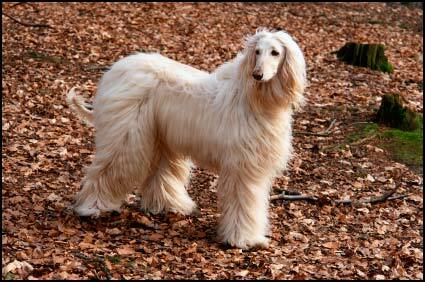 This year I learned all about the Afghan Hound. I couldn’t resist walking up to a gorgeous fluffy, brindle 6 mo. puppy. She had woolly hair sprouting everywhere, but as I looked into the ring I saw dogs with very short hair on their backs and long silky hair down their sides. I asked the handler about the proper coat for the breed and why the adult coats were so different. I knew the puppy was in her puppy coat and that would change but the adults in the ring still varied a lot. She explained that the coat naturally loses the hair along the back and on the face, sometimes even in patterns on the legs. The rest of the coat should be very silky so the sand would easily fall through and not cause chafing on the skin of the dog during a hunt or afterward. I asked “Then why was there a big male with a very woolly coat, looking so handsome I might add, even worth showing? His coat would not fit the standard.” She went on to tell me that some judges like a flashy coat and will choose a dog with a woolly coat that would not allow the dog to do his original job, but still looks great on the dog. Really? So it’s okay for a judge to determine that the standard isn’t good enough and they have the power to change what is permissible in their ring? WOW! I know I sound naive but I am consistently astonished by the lack of integrity in the human animal. For our own glory we breed dogs who are genetically unsound and justify it in the name of what? Ego? Money? Fashion? Trends? What happened to breeding dogs for what they were originally created for, and I am heart stricken by the changes that have occurred over time due to an ‘ideal’ for what’s attractive, showy and sells. Granted few Afghans are hunting in the desert any more, don’t know many Bulldogs who really mess with bulls these days, and when was the last time a Wolfhound really chased down a wolf? But I still get rather uptight when I see deep wrinkly faces on pugs – wrinkles that must be wiped every day to prevent bacterial infections. We know that Bulldogs and other brachycephalic dogs can’t handle the heat or shouldn’t get too excited because they can’t cool down fast enough and could perish. Most large headed dogs can’t even give birth on their own so they have to have a C-section. There are Cavaliers who have a genetic weakness that results in luxating patellas and Rhodesians who have an inherent, sometimes deadly flaw in the very trait that makes them a Ridgeback. The list is really limitless and just about every breed has a problem, but some of them are so foolish and can be prevented with thoughtful breeding. If you watch the wonderful PBS special on pure bred dogs we think you would agree. The British Kennel Club has even threatened the German Shepherd Club to correct their breed’s structural flaws or they will be booted out of the National Club. They seem ready to duel over the issue. Yet if you look at a great number of German Shepherds in the world their slanted gait is so exaggerated that the dogs appear crippled. We had one poor gentleman come to us for training and his dogs (from a reputable breeder) had such horrible back ends that we didn’t want to ask anything of them for fear they might injure themselves. It was tragic. Did you know that of all the hundreds of Pugs in the UK , their genetic makeup basically makes them clones of 50 pugs? They have been so closely bred that they are all little clones of each other. The show explains that such a statistic would place them on the endangered species list if they could be listed as such. Yet there are bucket loads of them. How have we let this happen? There was a group of ladies who are involved with showing/breeding Cavaliers and they knew that a grand champion had a serious genetic flaw that it was passing to all of his offspring, yet when they were confronted they became confrontational, or simply walked away refusing to face what they knew was immoral. I was astounded at their lack of concern for the very breed they said they treasured. It blows my mind that people in today’s society can still be so out of balance with what is morally correct. If we really had an attitude of “what is best for the dog’s interest” we would return to breeding structurally sound dogs with sensible traits, great temperaments and genetically potent lines. The second a fault showed up in a dog it would be spayed/neutered and live the rest of its happy life as a member of a family, not breeding to create more misery for both the animals and the people who fall in love with them… and suffer as they watch their animals suffer. I still enjoy going to the shows so I can get my fix, but I always go with a bit of trepidation in my heart as people parade their dogs past and I know that they are probably perpetuating the very problem that makes me shudder when a client shows up with the latest ‘fad’ dog who will probably suffer from genetic flaws and cause heartbreak to its family. Note – We have 5 purebred dogs in our pack of 8. We have rescued most of them and bought a couple as puppies. We do not think that purebred dogs should not exist – we believe they should be bred responsibly and with the utmost care for the breed standards and genetic strength. I use to watch the Westminister Show every year but was always bothered how everyone was trying to outdo each other to have the perfectly coiffed muttants parading for the judges. Not to mention the AKC registers puppy mill dogs then to see the “UK documentary Pedigree Dogs Exposed” I no longer will tune into their show. It’s all about money and nothing to better the animal. Tenderfoot – I couldn’t agree more with your comments about poor breeding standards. I have a Golden Retriever with every genetic fault that Goldens have been known to have – and some new ones too. And it’s all from poor breeding! So many breeds are genetically engineered for one particular trait and, as you point out, the detrimental traits are accepted instead of stopped in their tracks. What about hiring a professional care taker or breeder for your dog. I heard a lot of issues exploiting the breeding program. I have been in the business for more than 4 years now. Tenderfoot, great article. You’re mention of the “cripped” GSD is one of my BIGGEST pet peeves. Watching these pitiful animals even try to make it around the show ring is painful, but I share all of your views. GG, couldn’t have said it better myself, “perfectly coiffed muttants”! So true! My husband and I are relatively rare in our families. We prefer to save and rescue dogs, not contribute to pet overpopulation and in breeding. (At present we have four rescued dogs, two from the shelter, one from a breed rescue and one was a stray. I recently had to have my oldest dog put to sleep and he was a pound puppy as well). However our families do not agree. My mother was a backyard breeder of Bichon’s and Fox Terriers. One of those “breeders” who think as long as they are the same breed with papers, its fine. My sister breeds and shows champion Great Danes and my father in law breeds and shows champion Salukis. Granted, their dogs obviously do well at shows, but how many pups were born just so that they could have that ONE champion dog? Of course all of their pups go to good homes, with spay/neuter contracts, etc, as this is what “responsible” breeders do, however I have to question how responsible it is to continue to bring more and more dogs into the world just so that you can have a certificate or ribbon on your wall? Give me my good old mutts out of the shelter any day!